1.2 cups Almond Breeze Original Almond Milk You can substitute with any other (almond) milk flavor if you prefer. 9.0 oz chunks of dragonfruit I prefer PitayaPlus. .5 scoop Quest Protein Powder - Vanilla Milkshake You can substitute with your favorite protein powder or none at all. 1.0 tbsp Georgia Honey Farm - Wildflower Honey This ingredient is for sweetness. Use as much as you need. Grab all of the ingredients. Also, make sure you get a measuring cup and tablespoon measurer for accuracy. 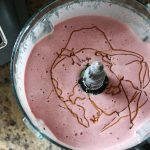 Pour the almond milk, dragonfruit, strawberries, matcha powder, and protein powder into the blender. Drizzle the honey over the other ingredients in the blender. Press the crush or blend setting on your blender. Let it blend for about 5 minutes, then check for smoothness. If it is still lumpy, blend for 3 more minutes. Repeat if necessary. Pour into your cup or bowl and enjoy! 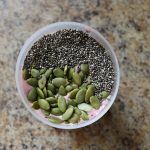 If you're making a smoothie bowl, sprinkle the trail mix and chia seeds over the smoothie and enjoy!